AND Right now you can Slide After Dark every Friday Night for only $5! Seriously - Friday Night Slides admission is only $5 from 8 pm – 10 pm and FREE for Season Passholders! You can also upgrade your daily ticket for only $5 and stay until 10 pm on Fridays. Ride your favorite slides after dark. Buy your season pass today and bring a buddy for FREE to Friday Night Slides with the coupon in your Season Pass booklet. 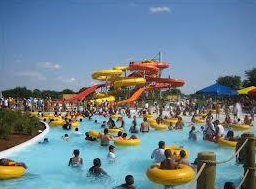 All 5 parks will have Friday Night Slides from now thru 8/16/13. Each park determines which attractions will be lit, so it is best to contact your park to be sure which attractions will be open for Friday Night Slides. Visit hfalls.com for regular park hours and more details!